George Francis Carrier (May 4, 1918 – March 8, 2002) was a mathematician and the T. Jefferson Coolidge Professor of Applied Mathematics Emeritus of Harvard University. He was particularly noted for his ability to intuitively model a physical system and then deduce an analytical solution. 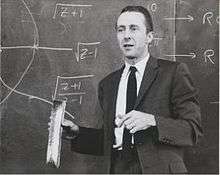 He worked especially in the modeling of fluid mechanics, combustion, and tsunamis. Born in Millinocket, Maine, he received a master's in engineering degree in 1939 and a Ph.D. in 1944 from Cornell University with a dissertation in applied mechanics entitled Investigations in the Field of Aeolotropic Elasticity and the Bending of the Sectorial-Plate under the supervision of J. Norman Goodier. He was co-author of a number of mathematical textbooks and over 100 journal papers. In 1990, he received the National Medal of Science, the United States' highest scientific award, presented by President Bush, for his contributions to the natural sciences. He died from esophageal cancer on March 8, 2002. ↑ Abernathy FH and Bryson AE (2007) George F. Carrier, in "Memorial Tributes: National Academy of Engineering", Vol. 11, 46-51.